Though they are not the only important ones, apart from the resolution and the bitrate, frame rate or frames (images) per second plays a major role giving the viewer a pleasurable experience while watching a video. And most movies (videos) still use a frame rate between 24 -- 30 as a ‘fps’ of 24 or beyond is just enough for fooling the eyes so that the moving images look like a video. But interestingly, according to the American file director ‘Douglas Trumbull’, who has done intensive research into the subject of frame rate and its effects on human emotion, has concluded that the emotional levels of the viewers reach their maximum when the frame rate is around 72, because at these frame rates, the motions are very fluid and the video look more realistic. If you like to try it out ;-), then the best way is to watch a video that was captured by a hardware that supports these ‘fps’ standards. But there are software technologies such as ‘Motion interpolation’ that lets us manually change the frame rate (on-the-fly) by using powerful video processing algorithms. They might not be as good as the genuine videos, still ..
And also, manually changing the fps of a video is a difficult task, once the encoding is done through a lossy codec thus, they usually require a lot of processing power too. Then again, newer powerful hardware can handle them under most situations anyway. 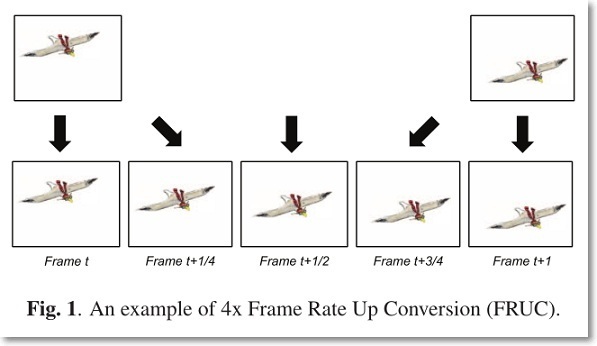 Let’s say that you have a video file with a frame rate of 24 and would like to convert it into a 60 FPS video. As you know a video is nothing but a collection of still images playing at high speeds. The ‘Motion interpolation’ tool extracts and scans these individual images and by using predictive technologies, it creates new still images and fills the gaps using them. For example, let’s say that (a very basic idea) your video only has about 30 frames (or images). Then first it will take the first two images and based on them it will try to come up with images that can be included between them because they are created to represent the total change that has occurred between those two images (as shown below). Once the same is done to the all 30 images, you will end up with a video that has a lot of additional still images (frames), and more still images means a more fluid animation. To get a better idea have a look at the below image. 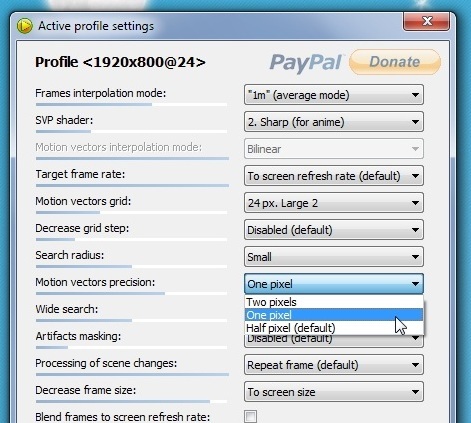 As a Windows user you can manually enable ‘Motion interpolation’ and watch videos at higher fps on-the-fly by using two utilities called ‘AviSynth’ and ‘ffdshow’. But once setup using them, unless you are an advanced user, you cannot change nor tweak settings easily. In that case you should try a utility called ‘SVP Manager’. It also uses the above mentioned ‘AviSynth’, ‘ffdshow’ (plus few other tools) but importantly, it gives you a GUI tool that you can use to tweak a lot of settings!. Also supports GPU acceleration (ATI, Nvidia and Intel). But it will not work on older GPUs. Unlike your CPU the GPU is designed and optimized to deal with graphics related tasks, as said before the ‘Motion interpolation’ requires powerful hardware (depends on the source video file such as its codec, resolution, bitrate etc), and by using the GPU, ‘Motion interpolation’ can be applied without involving the CPU that much. Well, it was pretty good!. As said before, it is difficult for a video processing tool to re-create frames once the lossy encoding is done. But after using ‘SVP manager’, it felt a bit weird at first but afterwards the videos look really nice and the movements looked like in real life (sometimes the movements felt a bit ‘artificial’ but that depends on the fps difference of the source and the output, plus the sensitivity of the viewer ;-)). I have an Intel Core i3 2330 (2.2 Ghz) CPU with integrated Intel HD 3000 and I played a 1080p HD video file (H.264, 30 fps, 9 Mbps, MP3 Stereo, MKV) with 60 fps (‘SVP’ automatically detects the optimum ‘fps’). It played without any issues whatsoever. However, as shown in the below screenshot, it did use 58-66% of my CPU while playing, where I were to play the same video without ‘Motion interpolation’, then the CPU usage was usually around 16-18% (even lower under ‘KMPlayer). While playing other non HD videos (with it enabled) such as AVI, the CPU usage was around 22-25%. There is an option in its ‘SVP manager’ called ‘GPU-accleration (OpenCL)’ but I could not enable it. And having ‘OpenCL’ enabled helps to reduce some load from the CPU. So if your GPU supports it, then make sure it’s enabled. Again as you can see from the above screenshot, while playing a 1080p HD video it used about 579-580 MB!. But this was as low as (relatively speaking) 170MB while playing a low-res AVI file. It even comes with a system monitor that lets you monitor the CPU usage, SVP index and its memory usage. You can access its main settings window (SVP manager) by double clicking on its icon on the system tray area that as said lets you change a huge number of settings (change the shortcuts, enable loading it on system startup -- disabled by default and a lot others). It also includes another pretty cool feature called the ‘Demonstration mode. Once you’ve enabled that, when playing a video, it divides the screen by half and to the left you’ll see a portion of the video without the ‘Motion interpolation’ and to the right it displays the video with it enabled, so you can compare the two easily. It comes with the ‘Media Player Classic’ (for the playback) and all the codecs needed for the multimedia playback and few other tools and I’m not going to write about all of its features here :). When in doubt you can let ‘SVP manager’ to adjust the settings automatically for you (frame rates etc). And you can always roll back your changes by selecting the ‘default’ option in each individual setting as well. It automatically installs a tool called ‘Haali Media Splitter’. If when playing MKV files the CPU usage is unusually high, then uninstall it and try replaying the files again (it messed up my MKV playback for some reason). And if you have the ‘K-Lite Codec pack’ installed, then I don’t know whether you would have to remove it before installing ‘SVP manager’. If interested please get it from this page. Also make sure to read its Forum as it too contains valuable information. It comes in two versions (they are both free!) and if unsure, go for the ‘SVP … full’ version. Oh and one more thing, if you have a laptop and while using ‘SVP’ if the CPU usage is high, then try not to use it when running on battery, otherwise it can drain it pretty quickly. Good luck.